Next post: My god, it’s full of goats! The last week has been pretty quiet, creatively speaking – work has been busy and almost all my remaining time has been spent on the book. But I have made significant progress – interviewed four more artists, annotated three interviews, and rewrote one entire chapter! Not bad for one week, especially since much of my attention has been at work. I have now finished all the artist interviews, I think. I had been considering doing a few more, but they eat up an unbelievable amount of time – about 3.5 hours per interview to set up, interview, annotate the interview transcript, and tag all the annotations. Since I only have twelve hours a week to work on the book, that means that just three interviews will eat an entire week’s work. Given that I’ve only got four and a half weeks until my (self-imposed) March 12 deadline for a complete-and-moderately-polished draft, I really need to get going on the manuscript. So I am declaring my interviews complete. I’ve talked to twenty-five artists already, and I think that’s enough. My goal for this week is to annotate the transcripts for my final three interviews, and finish rewriting the chapters on design. I have restructured the book into two parts, one about design and one about process. It’s a much more logical organization than what I had previously, and the book reads much better now, but I now need to do a good bit of editing to support the new scheme. I also need to add some examples. I was so surprised to find Seville sour oranges at the farmer’s market that I bought eight pounds. 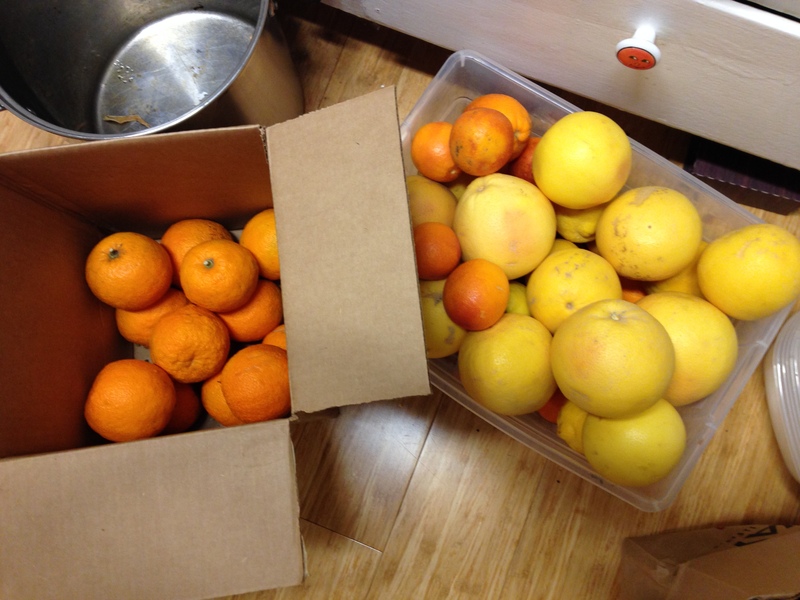 Then I went on a buying spree, getting another eight pounds of blood oranges and ten pounds of pink grapefruit. I have no idea where I got the impression that I’ll have time to process those into candied citrus and marmalade. There must have been chocolate fumes wafting through the air! As you can see, despite the work madness, I did carve out enough time to get started on the sea-turtle warp. 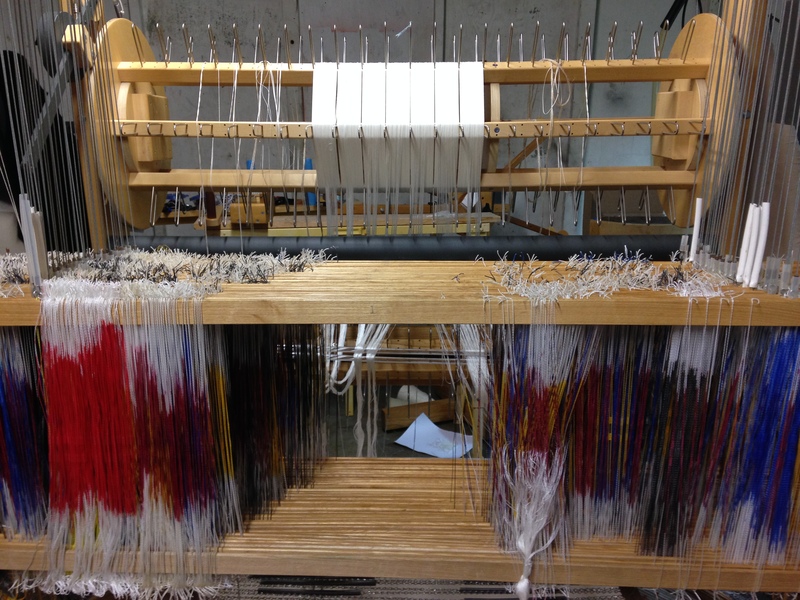 I beamed on a 14″ wide warp in 60/2 silk/cashmere yarn and am about 1/3 done threading it. I’ve also dyed the weft yarns – sea foam green for the tabby weft and deep indigo for the pattern weft. The book is fun too, of course. 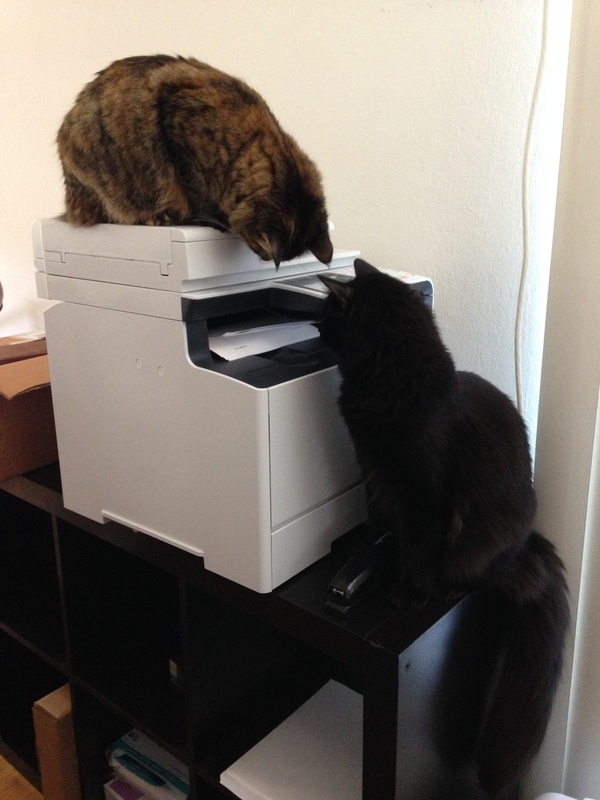 Particularly if you are a cat – or, better yet, a pair of cats – who are fascinated by the duplexing printer. 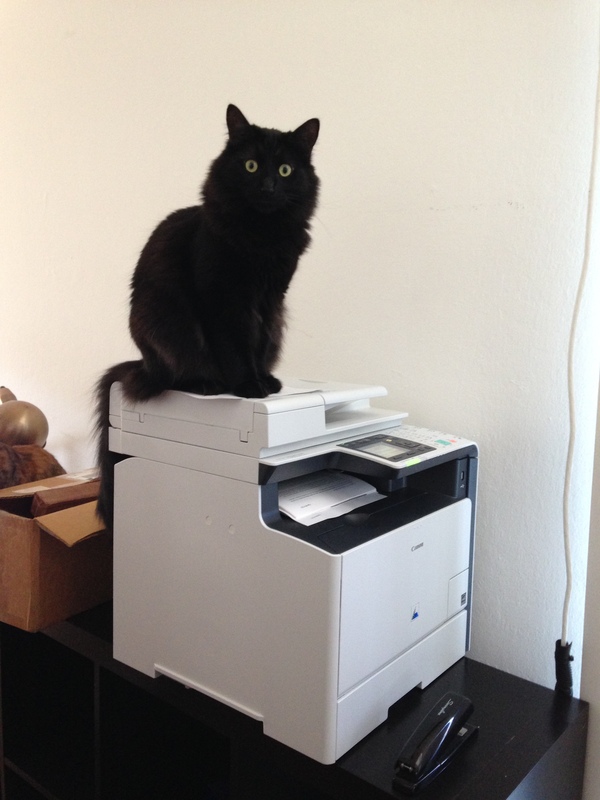 The printer makes clicky noises, hums a bit, and a sheet of paper appears! And then, almost immediately, it disappears again, only to reappear (with more clicks and hums) a few moments later. Magic! They could watch it endlessly. So a 117-page manuscript rolling out of the printer is pure, unadulterated joy. Love the cats also–think I read you maybe? more for what the cats are doing? Nah, I read your blog religiously and am still amazed at what you get done. I will buy the book. Thank you.